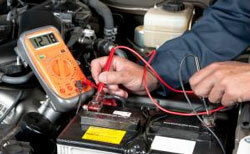 We have a specialist in 12v auto electrics to find the problems no one else can. If he can’t find it, it’s not there! We need a couple of days notice on all auto electric work being undertaken and usually we will need the car for a full day. Prices start from as little as £65 + VAT which could save you pounds from going to the main dealer.